Black technology cases don't show the dirt, but I love red cases for my technology! I was recently forwarded two new red tech cases for review and love both of them! Snugg has put some other thoughtful touches into this MBP 13" Wallet Case, too. Under the flap, you have a place to store business cards (or flash drives) as well as a cut-out in the case that allows you to charge your computer while it is in the case. And you can see the inside is lined with a soft material that keeps your Macbook scratch-free! Note the cut-out on the left that allows you to charge your computer while in the case! 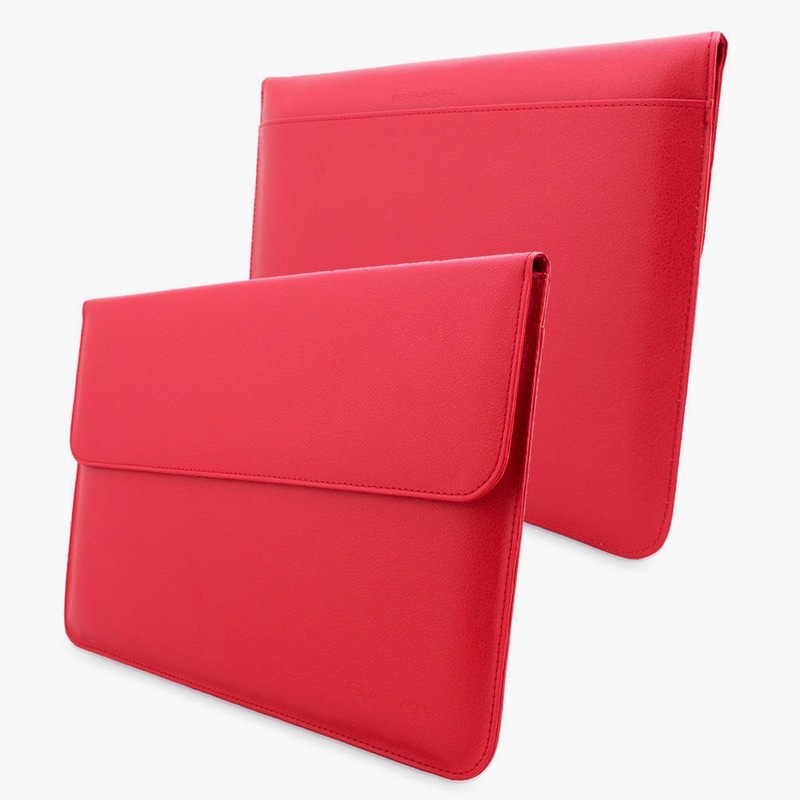 Now, if you are not a lover of red cases, the Snugg Leather MacbookAir and MacbookPro Wallet Cases are also available in black, brown, candy pink, orange, gray, baby blue, electric blue, hot pink and white leather, too! You can order the item from Snugg's site or on Amazon. The price at this writing is $35.99 on either site. 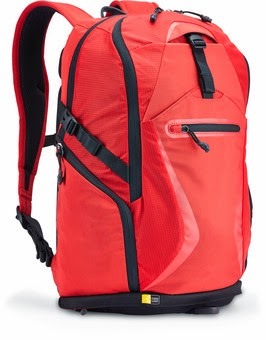 Case Logic makes a lot of backpacks for all different purposes, but I was drawn to the Griffith Park Backpack in red. This backpack also comes in black and gray. I am very particular about my backpacks. I only carry an 11" or 13" laptop when I travel, but I also have an iPad Air, my Google Glass and its case, and, of course, the chargers, cords, and dongles that are needed for presentations. The Griffith Park backpack has two main zippered sections. The back section has a padded pocket for the laptop and an additional pocket for a full-size iPad (or any 10.1" tablet). This section also has room for files, newspapers, or magazines. The second zippered section has a large pocket with two sections and another full-width pocket with a zippered, mesh pocket on the front of it with a key fob. This section has about a 2.5" width bottom. This is where I will carry my cable case, my Google Glass, or a light jacket for the plane. There are also other interesting pockets on the Griffith Park backpack. There is a felt-line zippered pocket at the top of the backback which is perfect protection for reading glasses, sunglasses, a point-and-shoot digital camera, or your phone. There is an open pocket on the front of the backpack with a quick-release clip where you can put those items you have to get to quickly like snacks, your boarding pass, or your paperback book. There are also two side pockets that can be used for storage and these are also designed to hold a water bottle. The most interesting pocket is one that is on the very bottom of the backpack. It is decent-sized, but not too deep. I might use this one for my toiletry quart-sized bag or even my small pocketbook, since it is easy to get to. 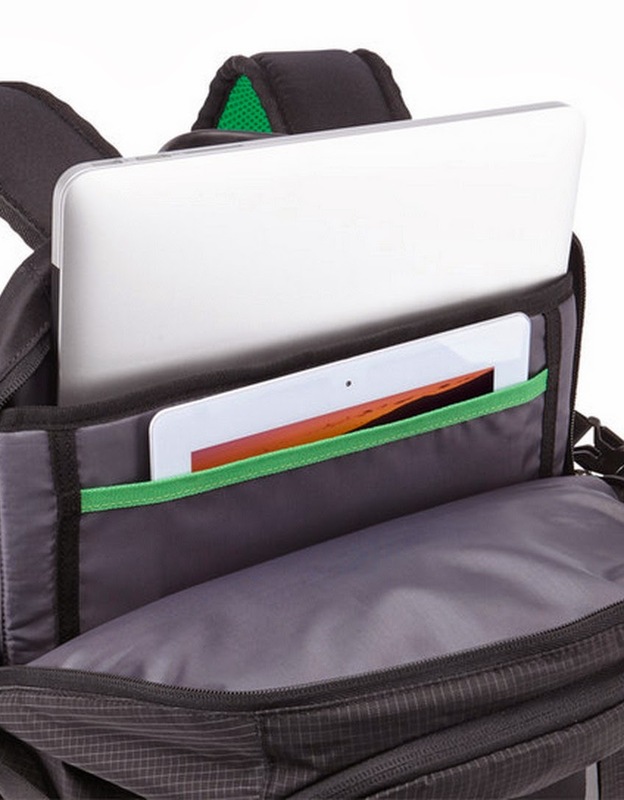 You could also store cables or unbreakable items in this bottom pocket, too. I bet I can even pack my airplane pillow in it if I squish it down enough! 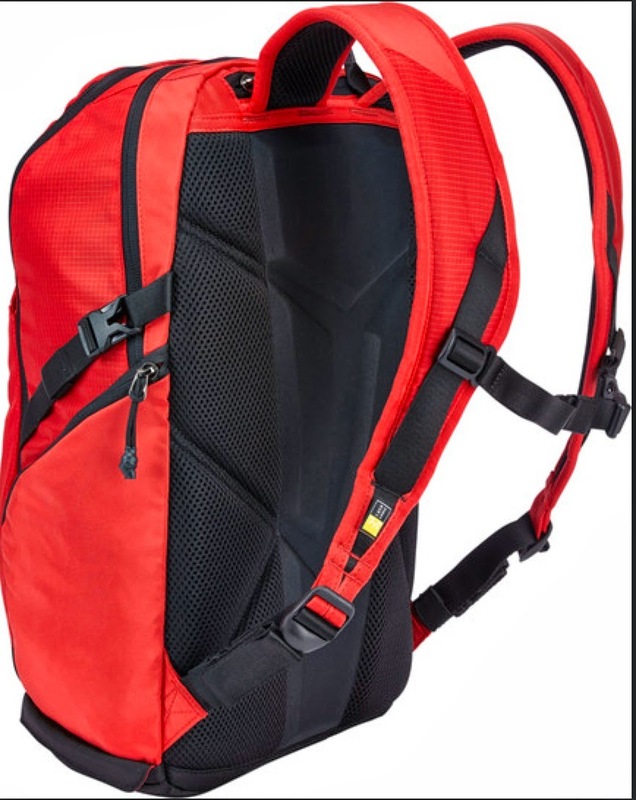 Size: 12" x 10" x 17.3"
Fits laptops up to : 9.8"x 1.1"x 14.3"
I like the fact the backpack is not wide and will fit nicely under a plane seat and, of course, I will stand out in a crowd with the cool red color! The Griffith Park backpack is available from the Case Logic site for $79.99) and from Amazon.